Looking for the perfect gift? 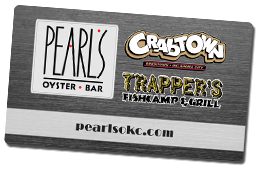 We’ve got you covered with our Pearl’s Restaurant Group Gift Cards! Available for use at all 3 of our unique restaurants, these gift cards will please even the pickiest of eaters. Whether it’s Pearl’s Oysters on the Half Shell, Trapper’s Famous Prime Rib, or Crabtown’s Shrimp & Crab Boils – there’s something for everyone! So give the gift of great Seafood & Cajun Cuisine and tie a bow around Oklahoma City’s best restaurants – make sure you get yourself one too! Cards will be mailed within 2 to 3 business days. If you need to pick up your card(s) the same day of purchase, please call our corporate office at 405.842.2174 ext. 301 to make arrangements.